Someone left this question tag in the comments section a couple of months ago. Better late than never..? 1. Would you rather be born a Muslim or covert and why? Born Muslim. Reverts sometimes have to deal with their families' not accepting them, and some leave Islam because they find it too intense starting everything at once without any support. I'd rather have Islam as part of my culture and upbringing. Besides, I think all born Muslims reach a point in their life when they have to either accept or reject the religion. 2. Favourite book that is g-rated (suitable for young) The Harry Potter series. 3. If you won the lottery what would you do with it? Buy property. 4. Most inspirational Muslimah you know. My mum! She's beautiful. 5. Number 1 thing you cannot leave home without. Keys? 6. Biggest problem faced as a Muslim teen. For me it was actually admitting that I'm a Muslim. That's kind of sad in hindsight. 7. Coke or Pepsi? Cannot tell the difference. 9. Favourite ice cream flavour. Cookie dough. 10. Cooking or baking? Baking, mainly because I can't cook..
11. Perfect age for marriage (both girl and guy). This is different for everyone but for me it's always 5 years older than my age at any given time.. So 28? 12. Celebrity crush. Don't have one. 13. Christianity or Judaism. In which context..? If it's which one I prefer, they're both religions of Allah (swt) so I don't have a preference. 14. What would you name your daughter? I'm not married so I haven't thought about baby names.. Plus I don't really want girls! 15. What would you name your son? I love the name Harith. 16. Colour that suits all skin tones. All colours suit all skin tones, it's finding the right shade that's important. 17. Your dream car. 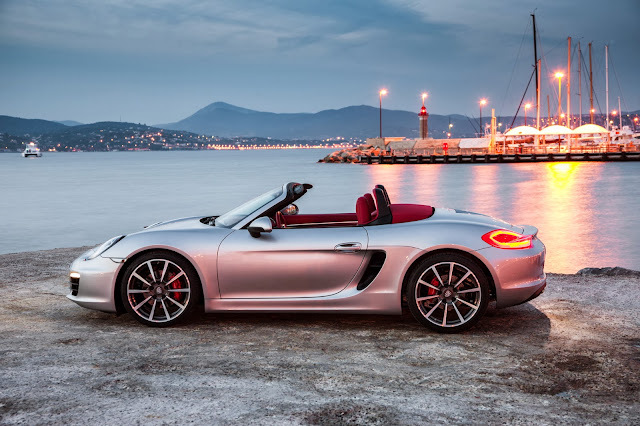 At the moment it's a hardtop Porsche Boxter. 18. Characteristics your husband must have. Tall (over 5'9"), intellectual (IQ over 120), successful (over £35,000 PA), older (by 2-8 years), no previous extramarital relationships (0), prays (5 td). It would also be excellent if he does not have a Facebook page. 19. If you could change eye colour, hair colour and skin colour, what colours would you choose? I really like green eyes, but I wouldn't change anything else. Lmao! I have to admit I laughed out loud when you said your ideal age for marriage is always 5 years more than than your current age. I'm the same! When I was 15 I was like 'Yeh I'll be married by the time I'm 21' and now I'm 22 and still not ready for marriage lol! Also (I don't say this to offend!) I find it strange that you rate success based on yearly salary! Surely success is more than that? I know we all want financial security but it's strange to grade success according to salary. And in regards to extramarital relations, if Allah can forgive, then surely you can too? I merely am saying this to bring light to your comments that could perhaps upset others. I hope I have not said anything wrong inshaAllah and I mean no harm. About the relationships comment, yes Allah (swt) forgives and I guess I could but the thought of marrying someone who has had previous relations outside of marriage sickens me a lot. I can't help it lol. Ahh glad I'm not alone with regards to the age of marriage! We're too young! I loved your husband comment!! It sounds like you turned around some of those misogynistic answers men give when asked what they want in a wife (which is pretty much that she shouldn't be seen or heard, and has to submit to her lordly husband). And no daughters? Why - I love girls!! About the girls, it sounds cliche and perhaps a bit old fashioned but we live in a mans world where women are abused and oppressed in all sorts of ways. Women are judged more, objectified more and generally more at the mercy of men. But I suppose I wouldn't mind a girl provided that she had some older brothers to look after her! Husband is missing another characteristic: Must be a non-freshie Arab, LOL! Assalamu 'alaikum. Great post! It's good to know a little more about you. Regarding the previous extramarital relationships, which others have also commented on, it's important to remember that you won't always know. And if your future husband is smart and has enough knowledge of Islam, even if he's been in relationships in the past and you ask him because you don't know, he won't tell you. We're told to hide our sins, even if that means hiding past haram relationships from a potential or current spouse, because sins that a person has repented for are between them and Allah swt (except tattoos, stds, and other things that will affect the future spouse whether hidden before marriage or not). I've just found your blog :). Hmmmm the Porsche is so amazing.Would also love to have one!